Complete energy autonomy, generated purely from clean, renewable sources. 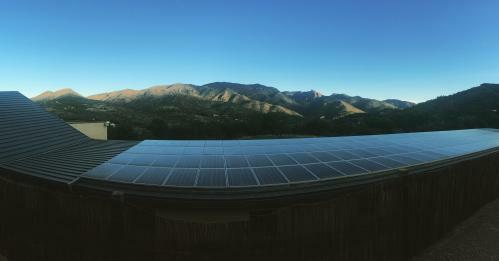 Crowdlending campaign for the expansion of the off-grid, self-consumption solar energy installation with batteries at the ecotourism complex "Mar de Fulles" in Castelló (Spain). Mar de Fulles is a brand new ecotourism concept, which describes itself as a Sustainable Eco-Management Network, consisting of a bioclimatic touristic complex located next to the nature park of Sierra de Espadán (Castelló, Spain) and a wild bird special protection area managed by Natura 2000. This pioneering and innovative project brings together ecology, sustainability and energy efficiency at a level never before seen in Spain. The construction of the complex respects in it entirety the forestal territory and follows the strictest criteria for environmental integration. The Mar de Fulles tourism complex supports all its electricity requirements through photovoltaic panels with support batteries. Replacement of the conventional air conditioning system with “VRV” aerothermal equipment, powered by renewable energy from the off-grid photovoltaic installation. Construction of a bicycle hut with natural woods. Ecological water treatment: Installation of a double green filter for the last phase of the wastewater treatment of the complex. 2 Studer Variostring VS-120 charge controllers, with maximum power point tracker (MPPT), and a maximum load capacity of 120 A / 48V. The charge regulators will be used to charge the battery banks using the energy coming from the photovoltaic modules. A new bank of batteries connected in parallel to existing ones formed by 24 units in series model Rolls 5000 Series 2YS31P. 2V - 3.426 Ah / C100. The air conditioning system will be extended with 3 outdoor units of inverter Heat Pump of different powers to fully cover the needs of the complex. The water purification system by means of Green Filter consists basically of the application of a controlled discharge of residual water on the surface of the land, where previously a forest mass or a culture has been installed. In addition to the purification of the effluent, this generates growth of plant species, usually timber trees, as well as the artificial recharge of the aquifer. The purification is done through the joint action of soil, microorganisms and plants through a triple action: physical (filtration), chemical (ion exchange, precipitation, oxide-reduction phenomena) and biological (degradation of organic matter) ; It takes place in the upper horizons of the terrain, where an active biological layer is found. Green filters generally consist of the cultivation of forest stands, which, in addition to favoring the purification of wastewater, indirectly achieve the protection of forests and the improvement of the quality of the atmosphere. In the case of Mar de Fulles, the green filter system consists of a first pond of 200 m2 and two secondary ones of 100 m2 each, with the introduction of macrophytes and prefiltration plants. Investing in this project is also open to non-Spanish residents. As it is a fully isolated solar energy grid, it is not affected by the Spanish "tax over the sun". "Mar de Fulles" will offer all investors who are lending €1,000 or more a 10% discount on the accommodation (excluding meals) price for their first stay at the resort. Panels or photovoltaic modules consist of a set of photovoltaic cells that produce electricity from light (electromagnetic radiation) that shines on them, through the photoelectric effect. For this project, the model ATERSA A305 P has been chosen . The inverter transforms the direct current from photovoltaic panels into alternating current for use in the installation. In this project, 3 models of different capacity are being used in order to optimize the installation. 3 INVERTERS OUTBACK VFXR 3,000 VA.
1 INVERTER SERIES OUTBACK RADIAN GS7048E 7,000 VA.
1 3-phase inverter INGETEAM INGECON SUN 30 30 KW. They allow to harness the power of the photovoltaic modules by accumulating and supplying power as and when needed. They are electrochemical systems based on reversible chemical reactions taking place inside the battery. In off grid installations it is necessary to store the energy captured during the hours of sunshine in order to cover supply when there is no or insufficient solar radiation. The batteries or accumulators play a fundamental role in the long term sustainability of a photovoltaic installation.